Home / Blog / Why Do We Grind Our Teeth? Teeth Grinding – Why do we grind our teeth? Teeth grinding can occur both during sleep and in wakeful periods. Unconsciously clenching your teeth when awake is called awake buxism. Most often caused by stress or even intense concentration, it is often a coping mechanism to deal with anxiety. Clenching and grinding during sleep is called sleep bruxism and usually has a number of potential causes from medication to disease as well as stress. People who suffer from bruxism will clench their jaws and grind their teeth back and forth. This action is potentially problematic as it can over time lead to tooth sensitivity, damage and even cracking. The most common cause of grinding and clenching is anxiety caused by stress. Excessive worry makes you prone to jaw clenching and sleep grinding. People who suffer from sleep apnoea or snoring are more likely to clench their teeth. Genetics. Many people who suffer from sleep bruxism also have family members who have the same problem. Those who suffer from sleep bruxism are likely to only discover this when the symptoms arise. Mild bruxism may not need to be treated but if you grind or clench your teeth often enough, it can lead to jaw disorders, headaches and tooth damage. It is therefore important to know the signs of bruxism and get regular dental care. 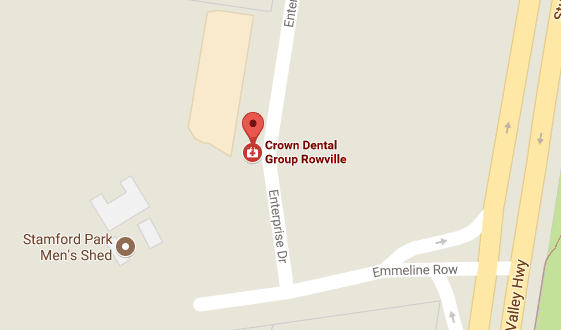 We recommend that you seek an appointment with Crown Dental Group if you suffer from any of the above symptoms or have any other tooth or jaw issues. Avoid chewing gum as it causes your jaw muscles to become accustomed to clenching, making you more likely to grind your teeth. At Crown Dental Group, we believe that one of the best treatments for sleep grinding is a mouth splint which will protect your teeth. Made from durable dental acrylic, this custom made and fit mouth piece can control the harmful effects of bruxism. Splints can also assist with sleep apnoea and snoring as well. 1. Why am I grinding my teeth? There are a number of possible causes behind teeth grinding. The most is anxiety caused by stress. Excessive worry makes you prone jaw clenching and sleep grinding. Certain medications and medical conditions can exacerbate or cause teeth grinding. Certain antidepressants, too much stomach acid reflux and Parkinson’s disease can all potentially cause grinding. People who suffer from sleep apnoea or snoring are more likely to clench their teeth. Many children suffer from sleep bruxism but it is likely to go away by the time they reach adulthood. People with more aggressive or competitive personalities may be more prone to bruxism. Smoking cigarettes can lead to grinding. Many people who suffer from sleep bruxism also have family members who have the same problem. Other disorders such as dementia, epilepsy, night terror and ADHD can all cause bruxism. 2. How do I stop grinding my teeth? 3. What are dental splints? Dental splints or mouth guards are considered one of the best treatments for grinding as they serve to protect your teeth from grinding during sleep. Made from durable dental acrylic, this custom made and fit mouth piece can control the harmful effects of teeth grinding.